What relevance does the eMac have, especially when you can buy a 1.42GHz Mac mini for £399? Actually, if you look closely at the specifications, benchmarks and prices, the eMac is a Mac worth considering - and in some cases, we suggest that you buy an eMac over a Mac mini. 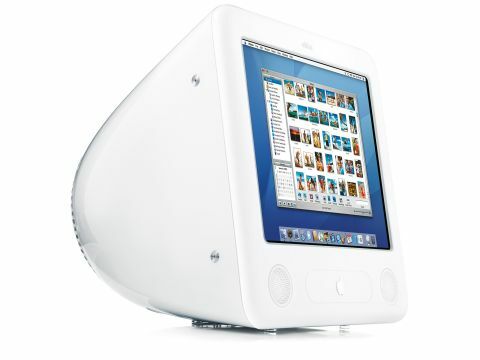 The eMac has the same 1.42GHz G4 processor and 167MHz frontside bus as the top-of-theline Mac mini. But that's where the similarities end. The Mac mini comes with 256MB of RAM - add £30 to the Mac mini price to upgrade to the eMac's stock 512MB. And while the eMac comes with an 8x double-layer SuperDrive, you have to pay £70 to upgrade the Mac mini's Combo Drive to a 4x single-layer SuperDrive. The eMac has a 64MB ATI Radeon 9600 video card; the Mac mini has a 32MB ATI Radeon 9200. But the most important difference is the eMac's 3.5-inch, 7,200rpm, 160GB hard drive. The mini comes with a 80GB, 4,200rpm notebook drive with no option to upgrade at purchase. If you adjust the price of the mini to include a SuperDrive and 512MB of RAM, the mini's price comes to £499, £180 less than the eMac. And if you buy a new display, keyboard and mouse, the price of the mini climbs even higher. Factor in the hard drive differences and the eMac starts looking like a good deal. While the eMac and Mac mini we tested contained the same processor, frontside bus and RAM, we saw speed differences in favour of the eMac, thanks to the Western Digital Caviar SE hard drive in our test unit. The eMac performed a Photoshop CS2 action 37% faster than the mini, duplicated a 2GB file in the Finder 46% faster, ripped a CD to MP3 in iTunes 21% faster, and created a DVD image in iDVD 32% faster.